A side by side comparison of two American Pilsners. 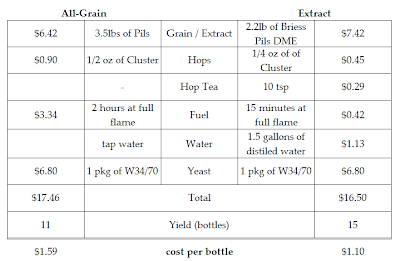 The cost of making beer with extract compared to making it with all-grain is occasionally debated, but when it is, it's always fierce. The goal of this comparison was to see what makes sense for me. The results here are not to say that any one is better than the other. It's really just me sharing my personal decision. If you are curious if all-grain or extract costs more for you I encourage you to perform the evaluation using your own economic factors. These two beers were brewed as close to each other as possible with the exception that one is all grain, and the other is extract based. Hop tea was made ahead of time to use for several batches of beer with high alpha hops and a two hour boil time. See my book for more details. The cost of heating the water for the all grain batch was appreciable. Between the mash, sparge, and boil my burner was on full tilt for 2 hours. My last gas bill indicates that natural gas costs me $0.0139 per cubic foot. At that rate my stove costs $1.67 per hour to run one burner at full heat. That's $3.34 in fuel costs. The amount of heat use to make the hop tea was trivial by comparison. For extract brewing I use distilled water because the minerals are already in the extract. This costs $0.75 per gallon at my local grocery store which added $1.13 to the extract beer. When brewing all-grain I use tap water because the mineral content is needed for acidification of the mash, among other things. By comparison, the tap water is virtually free. Making the extract took 12 minutes from weighing the first ingredient to pitching the yeast. The all grain batch took 5 hours. 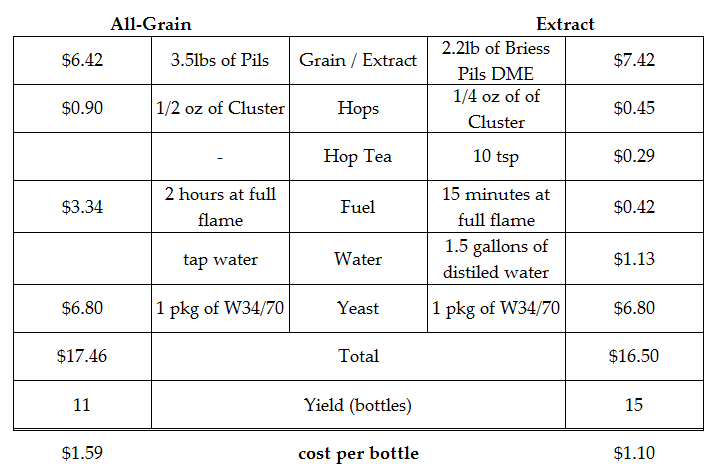 All grain methods typically loss 20% of the beer to trub, although with this batch it was 29%. It is common to start with 6 gallons at the end of the boil, transfer 5.5 to the fermentor and have 5 gallons for bottling. When brewing with extract the trub losses are lower because extract as already been boiled once. This means that the extract has already gone through one hot break. This batch was fairly typical at 10% trub loss. But how do they taste? that's the real question. To judge the verdict of taste, I selected half a dozen of my friends be the lucky ones. (Well... Really I begged and pleaded to persuaded them to compare the two beers. Same thing right?) In a blind tasting of these beers none of them preferred the all grain beer, and some of them preferred the extract beer! I was shocked. So I made a second beer. This time it was an IPA instead of a Pilsner, and the response was the same. The difference in cell density was interesting. After bottling the beer the remaining slurry was weighted. Because the two had the same starting gravity, yeast strain and fermentation conditions the total number of yeast cells produced should be nearly identical. The all grain batch had 1,124g of slurry remaining while the extract batch measured it at only 326g. This means that the cell density of the extract batch was about 3 times higher than that of the all grain. This means when storing yeast, the same number of cells taken from extract beers take up about one third of the space in your fridge compared to all grain. A recipe that used more specialty malts would have allowed the all-grain batch to shine, but with a steep or partial mash the same flavors could be imparted on the extract batch. Oddly enough, my exBEERiment yielded somewhat similar results. Hmph. Briess DME is made with Carapils, so the recipes aren't truly equivalent. Likewise, in Brulosopher's trial the darker colour of the supposedly 100% Maris Otter liquid extract suggests it's quite different from all-grain MO. Maybe it got cooked a little during manufacturer, increasing melanoidin or dextrin levels? Yes, the two aren't identical. The goal was to make them as similar as I possible so that they could be compared on a fairly level field. Extract brews do generally come out darker than their all grain counterparts. Because the extract was boiled when it was manufactured, if it is boiled again in your kitchen or brewery for the same amount of time as a "equivalent" all grain batch I would expect the extract brew to be darker. These two actually came out very close to the same color which I believe is because I did not boil the extract. It's interesting that DME came out the same colour but Brulosopher's LME gave a much darker boil. I guess different manufacturers might make their extract in different ways. Most use vacuum evaporation, so although the wort is technically boiled it happens well below normal boiling temperature and shouldn't darken the colour. Briess's website says their DME is 1% Carapils so it's not far off the 100% all-grain recipe. Because my extract beer was not boiled and the Brulospher extract beer was boiled I would expect that his would have come out darker. Yes, there is some variance between manufactures when it comes to extracts. At Briess, the first stages of making extract are the same as brewing. The grains are mashed, laughtered, boiled, whirl pooled. The difference is that extract then goes to an evaporate while for beer it goes to a fermentor.